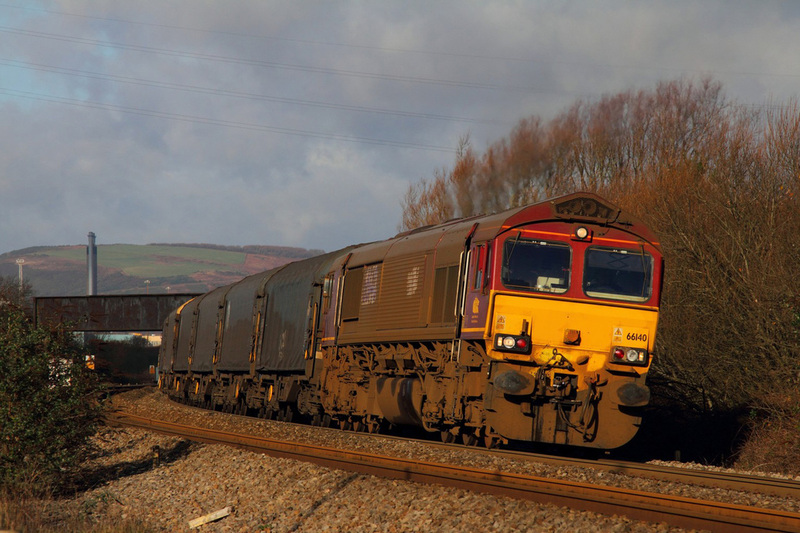 EWS RHTT liveried 66140 powers away from Margam at Margam Moors junction on the 27th December 2014 with 6H27 11:56 Margam to Llanwern loaded steel. 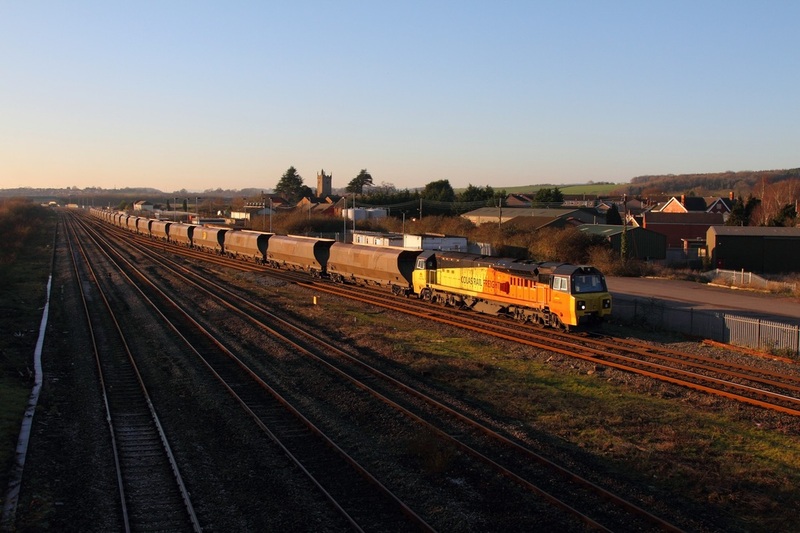 A glinty shot as Colas Rail 70804 hauls the 4C30 Aberthaw to Gloucester New Yard at Severn Tunnel junction running over 200 minutes late on the 29th December 2014. 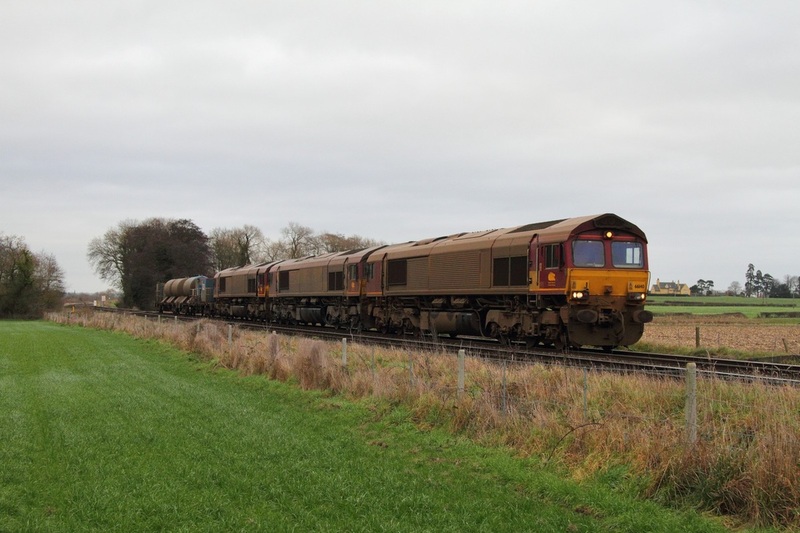 Direct Rail Services' 66432 rounds the curve hauling the 4V38 Daventry to Wentloog at Bullo Pill on the 28th December 2014. 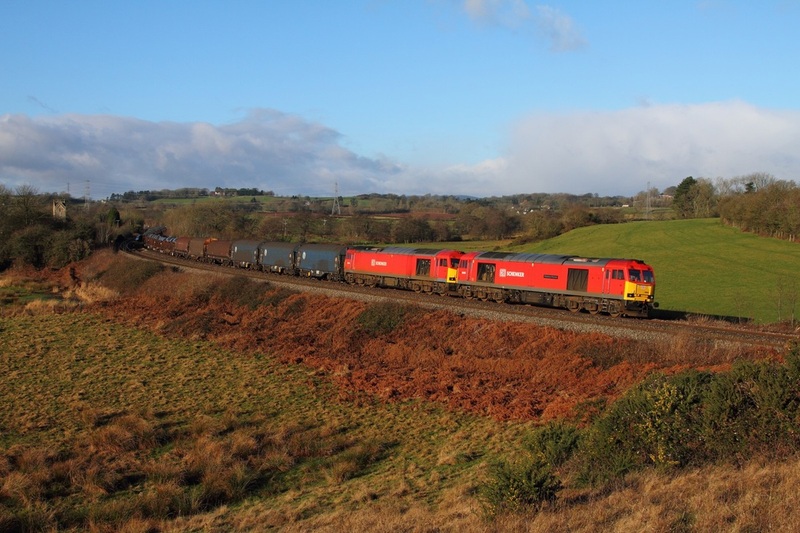 DB Schenker's 60062 leads 60044 on the 6H25 Margam to Llanwern at St Georges east of Miskin on the 27th December 2014. 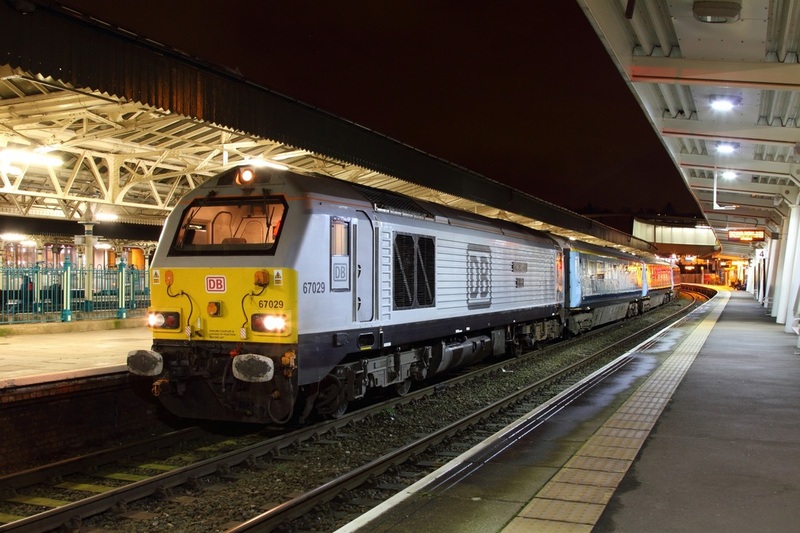 DB Schenker's silver 67029 works the 1W96 17:16 Cardiff Central to Holyhead WAG express at Newport on the 23rd December 2014. 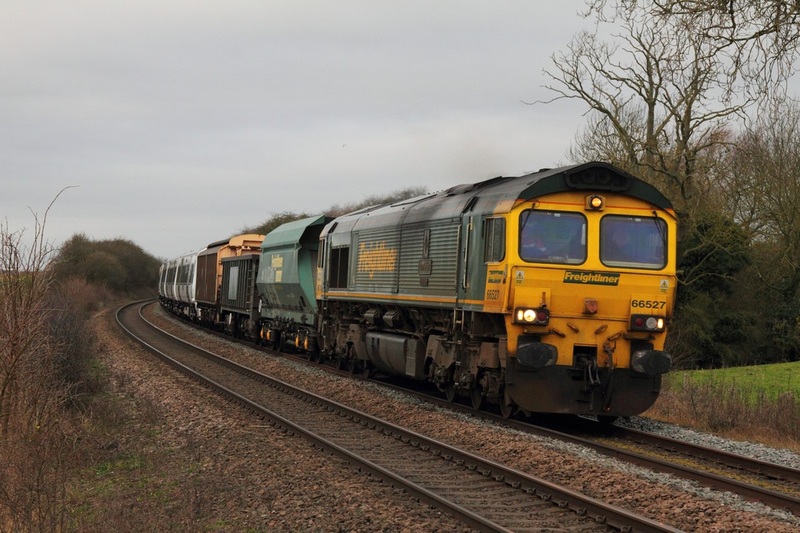 Freightliner's 66507 hauls 387116 on the 7X33 Old Dalby to Bletchley at Brentingby, Wyfordby on the 22nd December 2014. 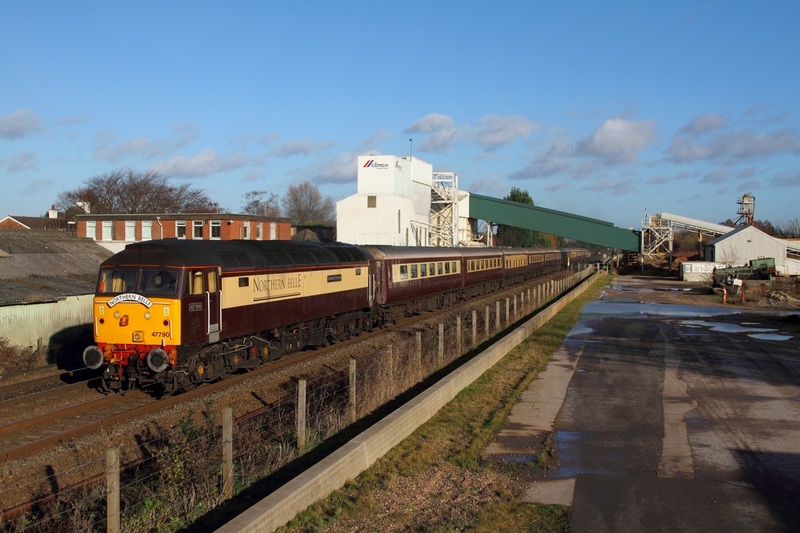 DRS 37218 propels 82112 into the works at Brush Loughborough, running as 5Z37 ex-Norwich on the 22nd December 2014. 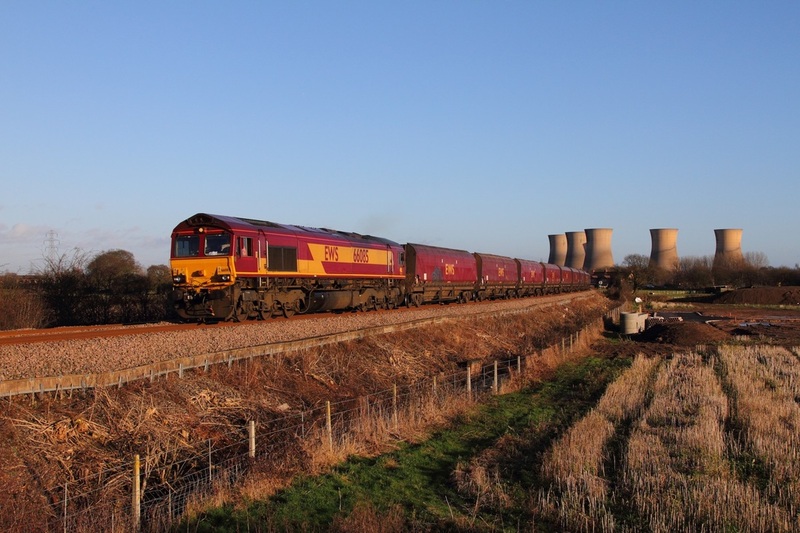 66140 leads 047, 050 and a RHTT set on the 6Z71 Peterborough LIP to Toton at East Goscote near Syston on the 22nd December 2014. 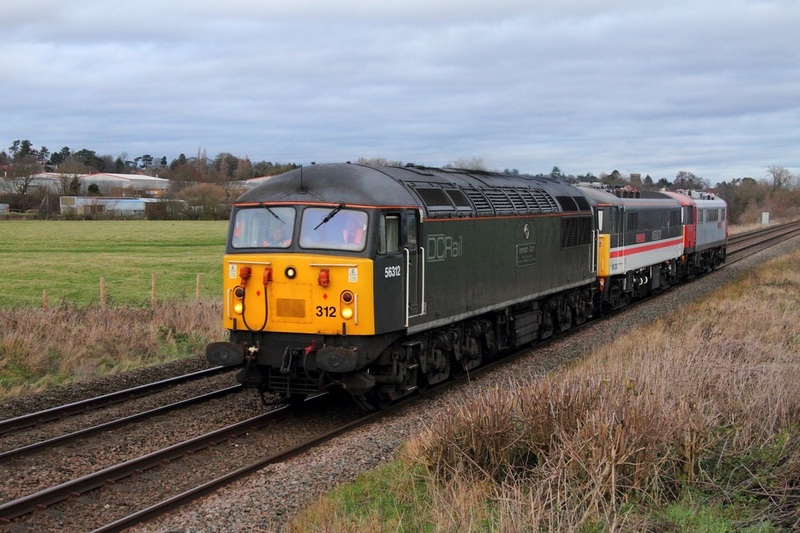 DCR 56103 leads 56303 on the 6Z35 Chaddesden to Wellingborough at Cossington and again at the Syston bypass on the 22nd December 2014. 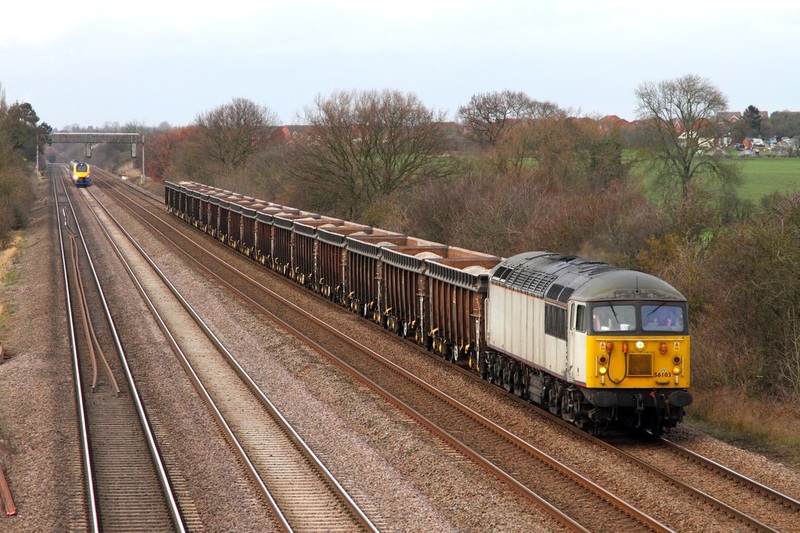 DRS 68004 hauls the 6U76 Crewe Basford Hall to Mountsorrel empty ballast wagons, running 70 minutes late at Thurmaston south of Syston nearing its destination on the 22nd December 2014. 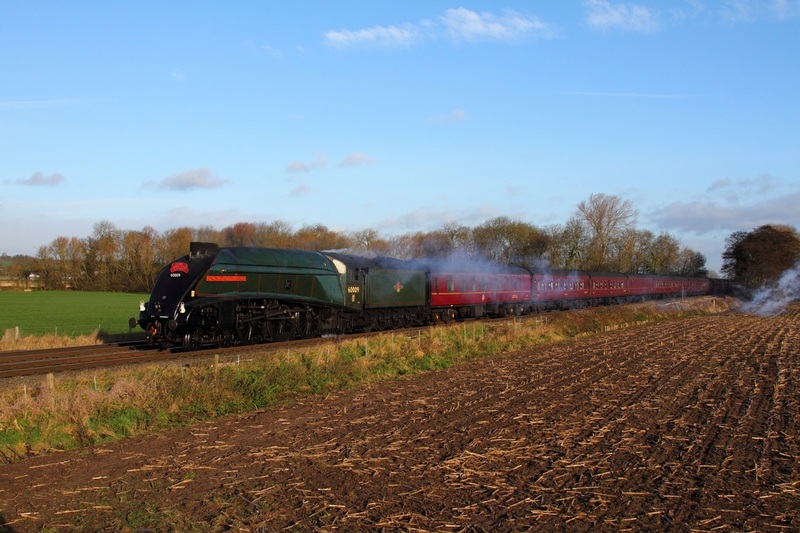 60009 'Union of South Africa' leads the 1Z72 London Victoria to York at East Goscote on the 20th December 2014. Northern Belle liveried 47790 leads class-mate 57305 on the 1Z31 1200 Nottingham to Sheffield "Northern Belle" circular via Gainsborough. 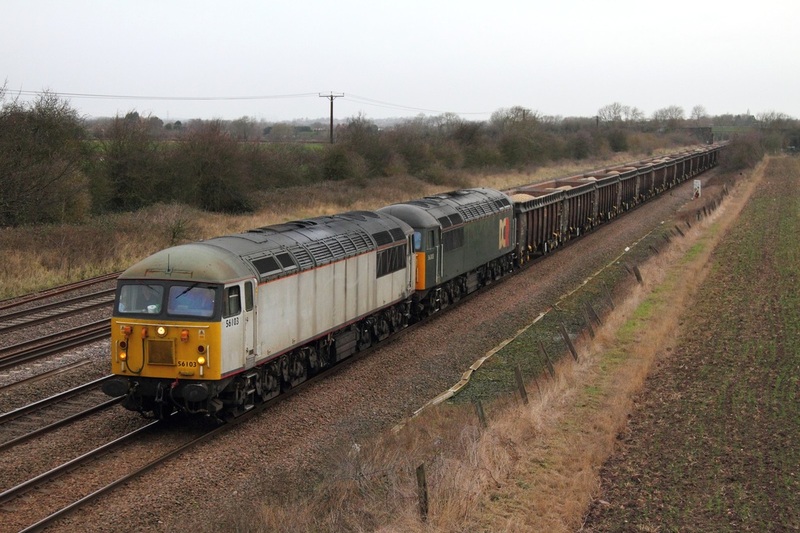 The luxury train passes under the Cemex quarry plant on the approach to Attenborough, shortly after departing Beeston on the 19th December 2014. 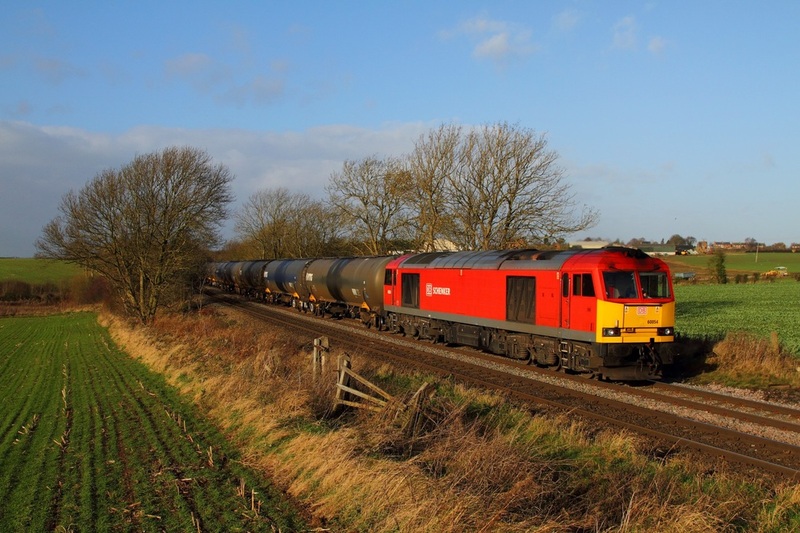 DB Schenker's 60010 is captured at Stenson Bubble working the 6M00 Humber to Kingsbury tanks on the 19th December 2014. 6E54 was over an hour late and 6M57 was caped. 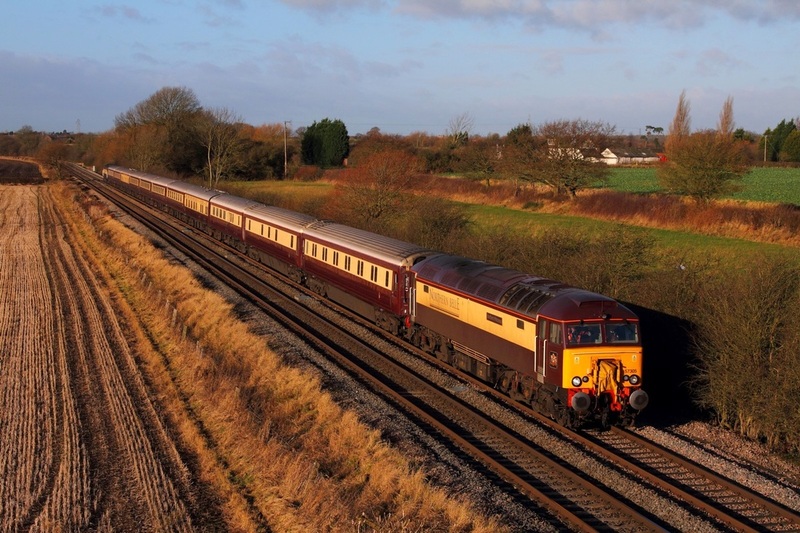 Northern Belle liveried 57305 leads 47790 on the 5Z31 Crewe CS to Nottingham at Barrow upon Trent on the 19th December 2014. 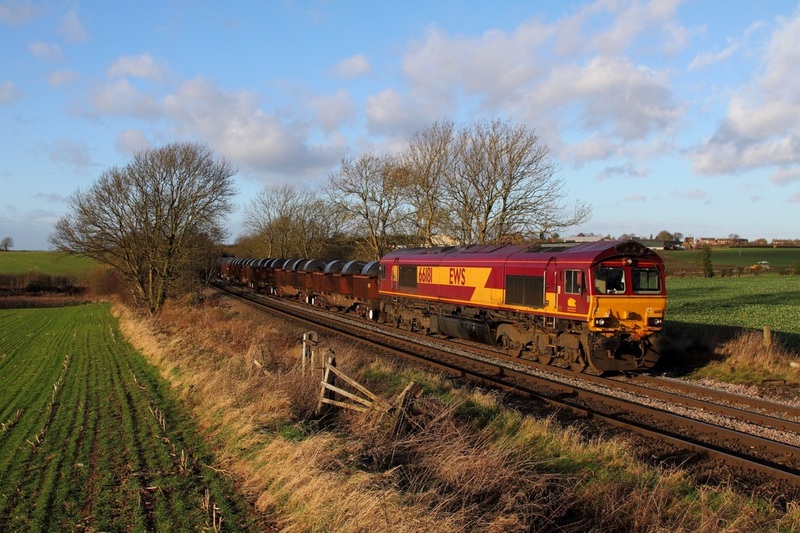 66181 hauls the 6M96 Margam to Corby loaded steel coils at Chellaston on the 19th December 2014. 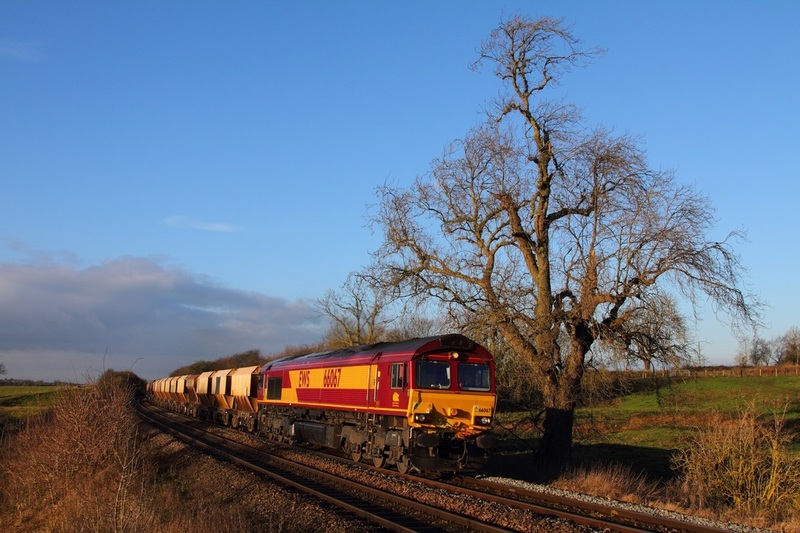 66085 hauls the 6Z37 Ratcliffe to Arpley sidings at Willington (Uttoxeter line) on the 19th December 2014. 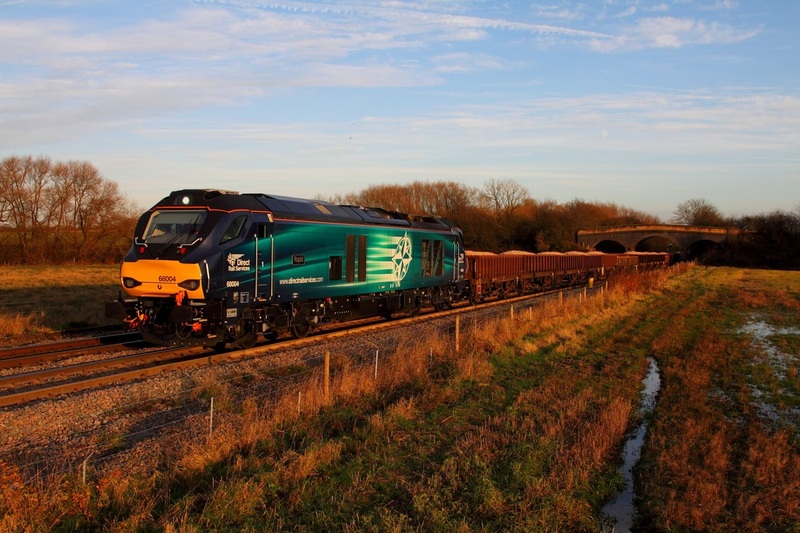 60079 hauls the delayed 6E54 Kingsbury to Humber at Chellaston on the 19th December 2014. 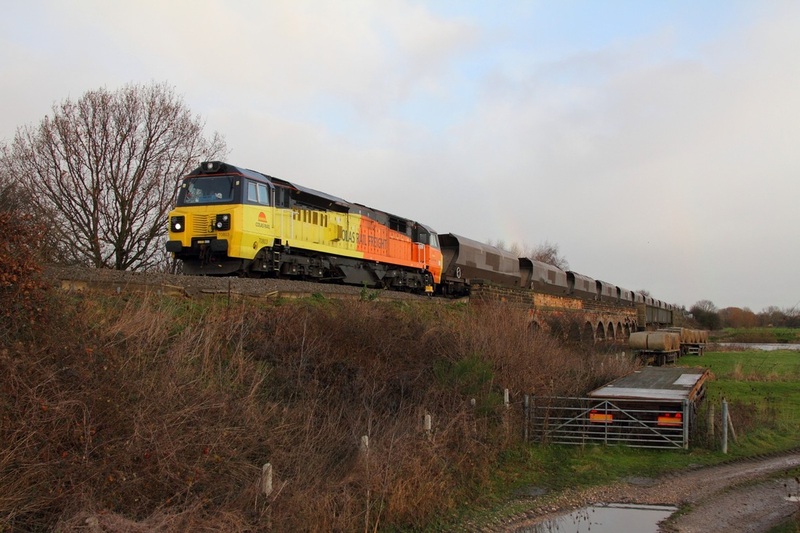 Colas Rail 70803 leads the 4V14 Ratcliffe to Gloucester at Sawley viaduct on the 20th December 2014. 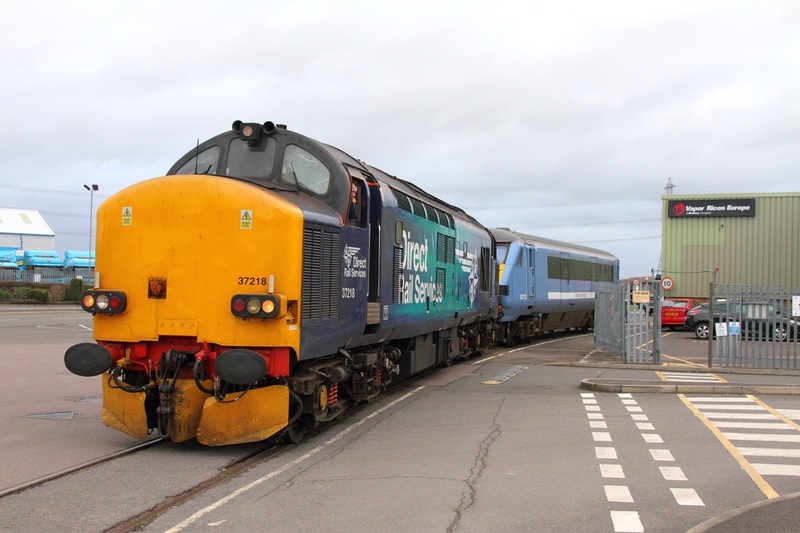 70803 had replaced 66848 yesterday in Bristol. 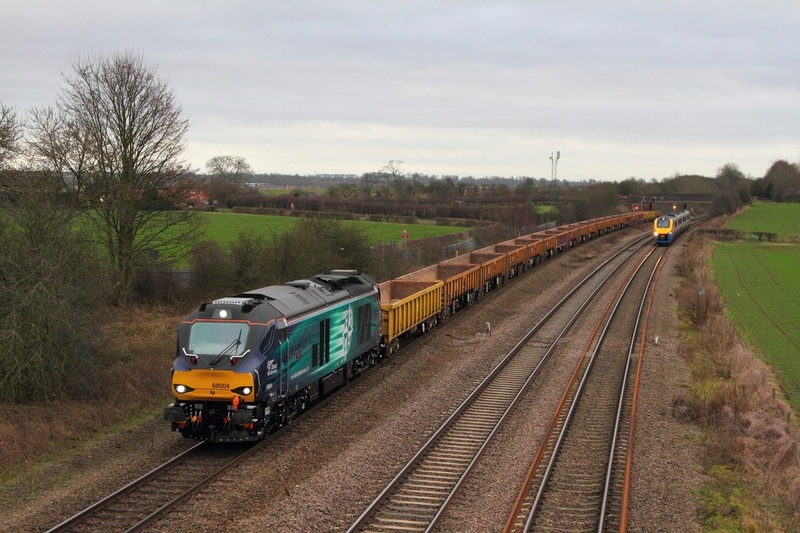 DC Rail liveried 56312 leads Inter City liveried 86213 and ETL rail liveried 86702 on the 0Z86 Barrow Hill to Willesden at Narborough on the 18th December 2014. 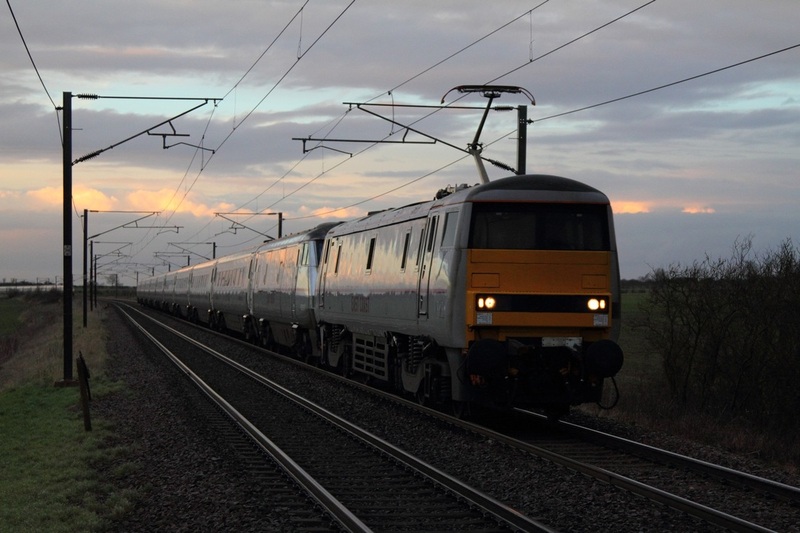 With an atmospheric sun-setting sky, 91103 blunt-end leading, works the delayed 1E10 1000 Edinburgh to London Kings Cross at Frinkley Lane on the 15th December 2014. 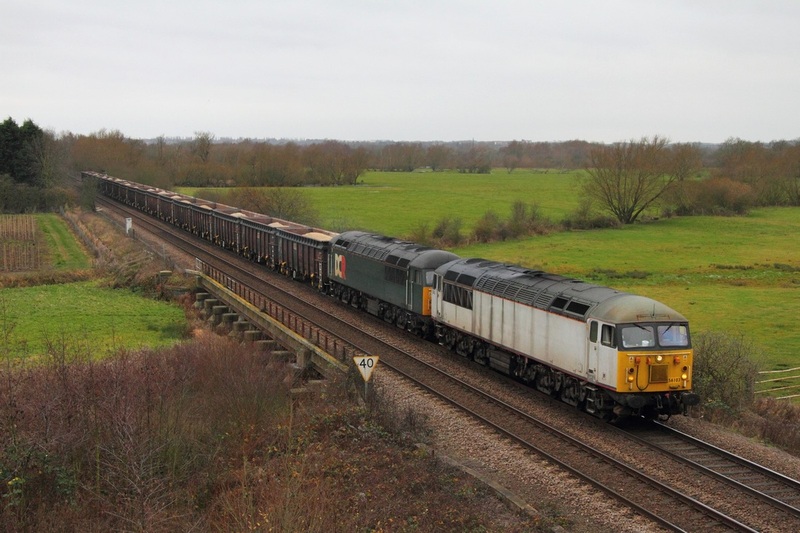 EWS liveried 90035 tails DB Schenker liveried 90018 on the 0A06 Crewe to Wembley at Ansty adjacent to the Oxford Canal on the 10th November 2014. DRS Northern Belle liveried 57305 "Northern Princess" hauls the 5X52 09:55 Old Dalby to Ilford unit drag consisting of 379013 at Brentingby level crossing, Wyfordby east of Melton Mowbray on the 16th December 2014. The unit having received a prototype battery had been on test on the Old Dalby test track. 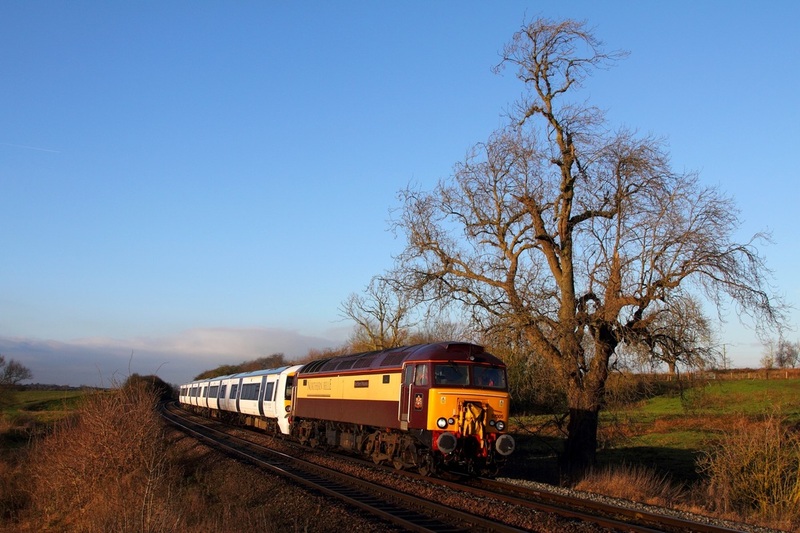 56103 on the 6Z36 Chaddesden to Wellingborough at Cossington on the 15th December 2014. 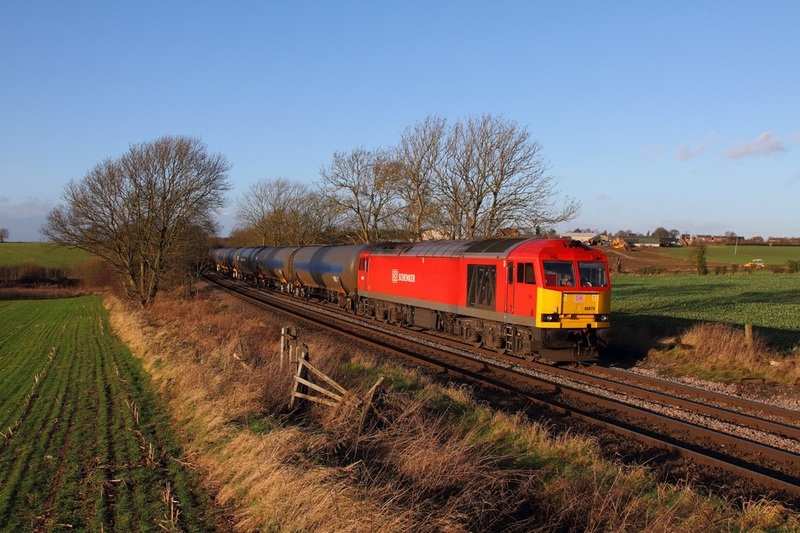 66067 on the 6L43 Mountsorrel to Kennett at Brentingby level crossing in Wyfordby on the 15th December 2014. 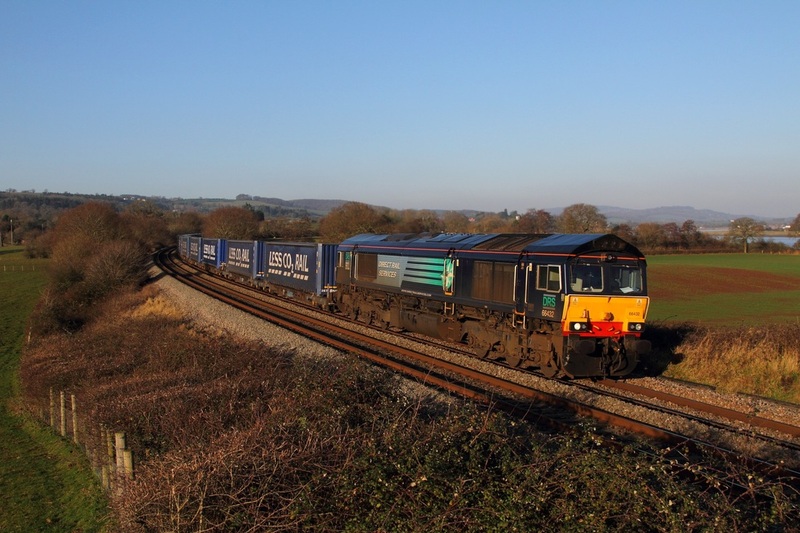 GBRf ex-First Barbie liveried 66726 powers the 6E89 Portbury to West Burton at Barrow upon Trent in crisp lighting on the 13th December 2014. 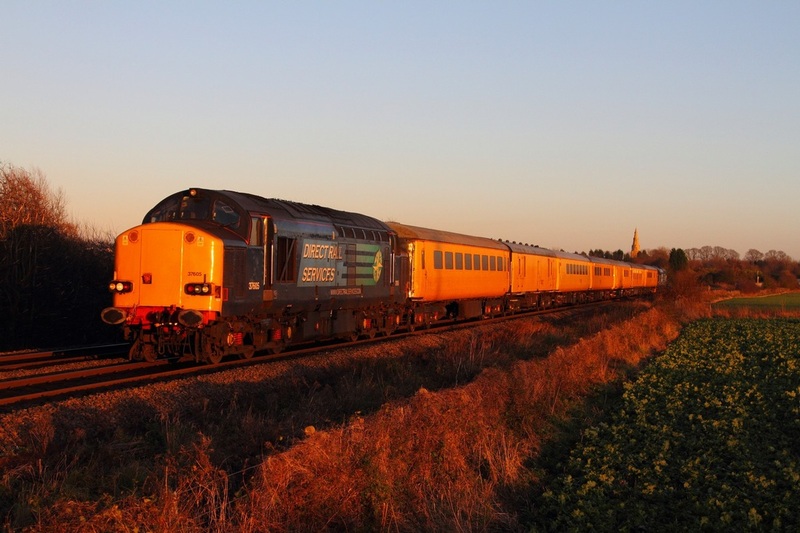 In the very last of the day's sunshine, DRS 37605 leads classmate 37402 on the 3Z48 Hither Green to Derby at Asfordby on the 13th December 2014. 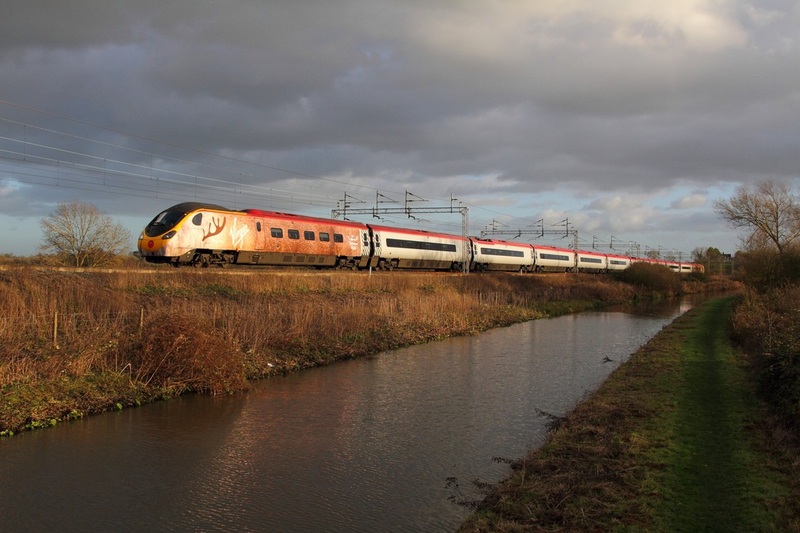 Virgin Trains' #TrainDeer no. 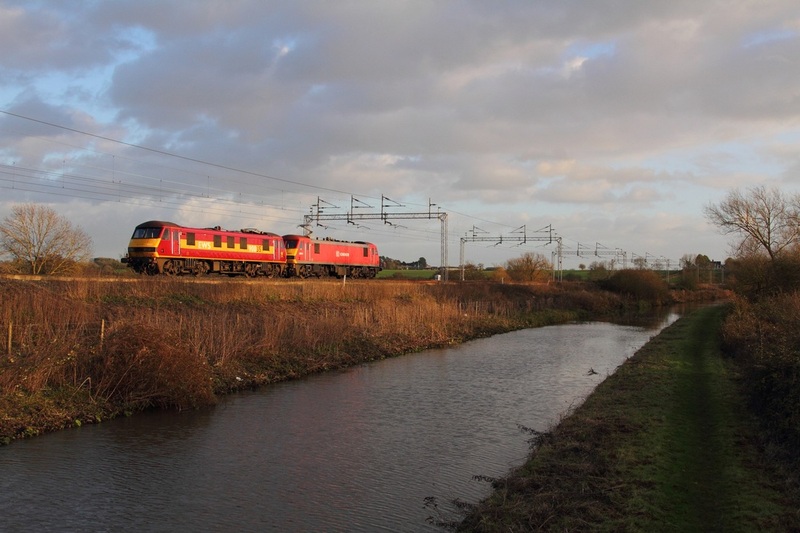 390112 works the 1H68 13:40 London Euston to Manchester Piccadilly at Ansty, north of Rugby, adjacent to the Oxford Canal on the 10th December 2014. 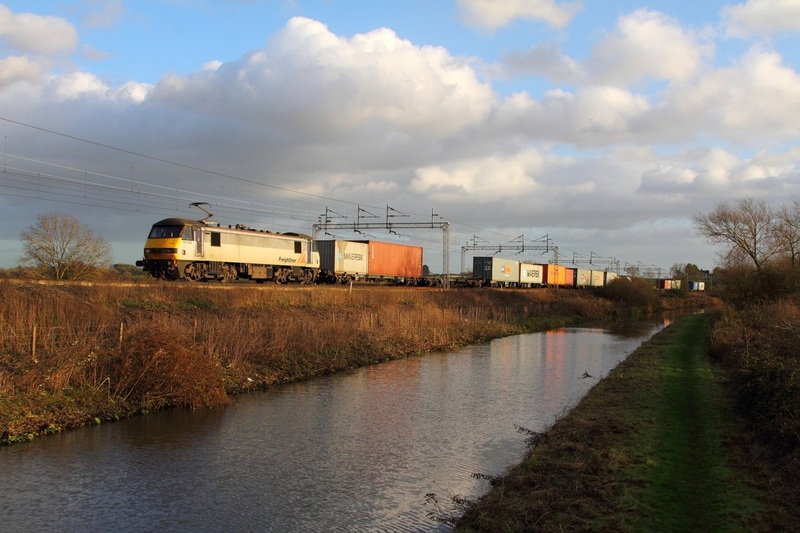 Freightliner grey 90048 hauls the 4M81 Felixstowe to Crewe Basford Hall at Ansty on the 10th December 2014. 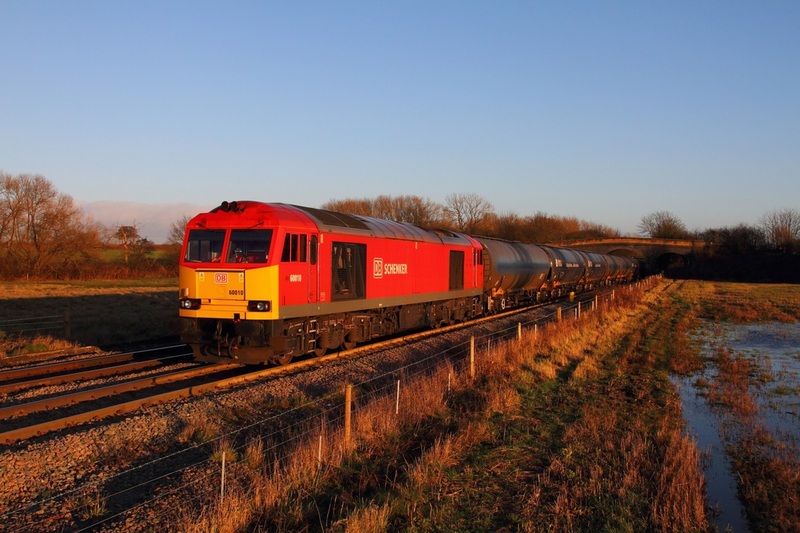 DB Schenker's 60054 on the 6E54 Kingsbury to Lindsey at Chellaston on the 10th December 2014. 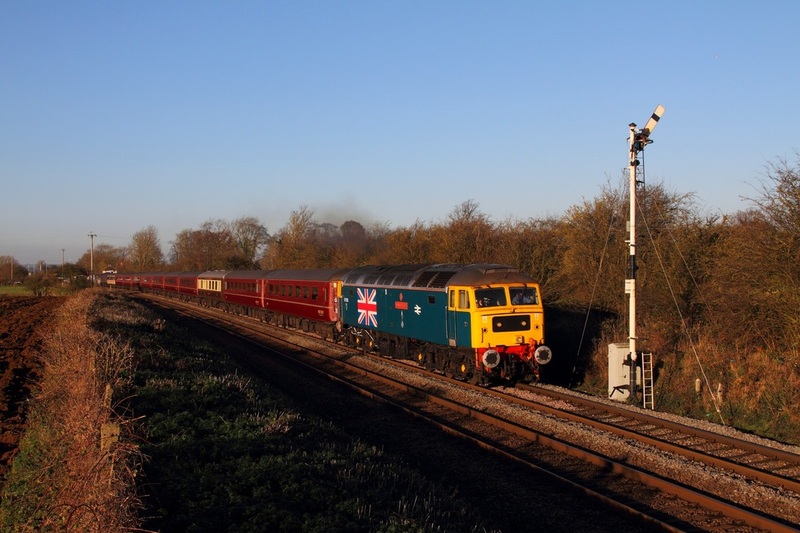 Br Large Logo Blue (with Union Jack) 47580 leads 47804 on the 5Z14 Carnforth to Norwich at Ashwell on the 5th December 2014. 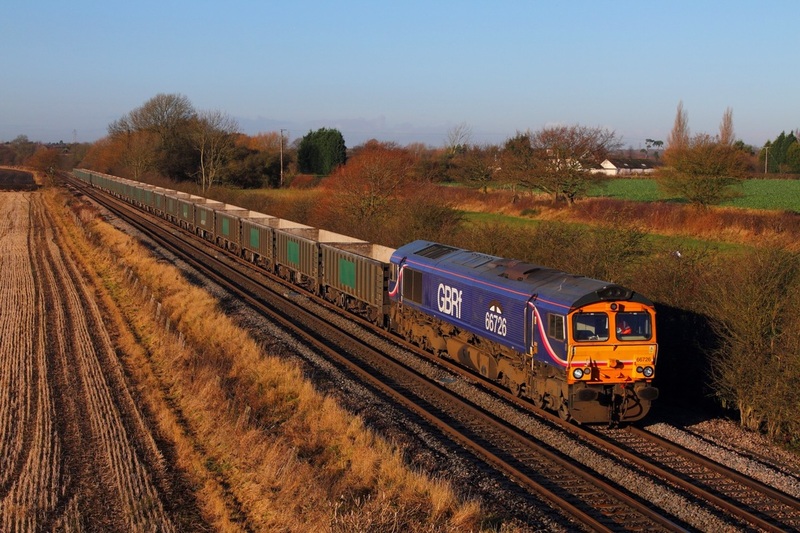 DRS 68004 "Rapid" hauls the 6U76 Mountsorrel to Crewe Basford Hall loaded ballast train at Stenson Bubble on the 2nd December 2014.